Dear readers, once again, I apologize for the inconsistent postings. My life is full of many activities at the moment, and I will have to write my posts whenever I have the opportunity. 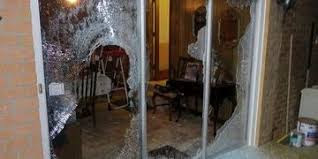 A checker at my grocery store told me about an incident in her family where her two young sons, during a squabble, hit a sliding glass door with a magnet and shattered the glass. The dreamer made metaphoric associations of each of the dream symbols, and now we have reassembled the dream in its metaphoric version. The dream retold as metaphor. There is a part of me that I love to death, but this part of me can be rowdy. Mostly this part of me is good and tries really hard and really cares. This part of me is just starting its formal education. There’s a section of this part of me that has had a bit more experience and is expected to shoulder a bit more responsibility. But this section is being aggravating and deliberately annoying. Then the other section is more innocent, not as shrewd yet, or as purposefully manipulative. The more experienced aggravating section of me grabbed something in me that pulls things into its sphere. This sphere-puller is a force of nature, and even though it’s not intended for mature use, it still works. The aggravating section was deliberately trying to upset the more innocent section. Once it was finished, the aggravating section didn’t really want to keep the sphere-puller; that wasn’t the point. And once it had achieved its purpose of upsetting its innocent counterpart, it didn’t want the sphere-puller anymore. So it got rid of it in the place of greatest privacy and intimacy in myself. This private area in me has its own sacredness. The aggravating section threw the sphere-puller hard to get rid of it. Disposed of it. Then everything seemed to be over. The innocent section of me is young so it can shift on a dime. It found other things to do. There was no more energy expended. I took both sections to their place in me of learning. That’s when I looked at the sacred, private place within me that I’ve just remodeled, and this is where I look out to see the view. It was destroyed in a violent way. I had no idea what had made this happen. Perhaps a prankster and interloper in me had wanted to do something malicious. The breakage was mostly on the interior. I spotted the culprit; it was the sphere-puller. I consulted the partner and the authority figure in me. No one had tried to be bad or do something wrong. It’s part of the nature of young masculine energy in me. It doesn’t really know, yet, how far is too far. It was a silent event; there was no sudden alarm. I didn’t know if I should scold myself and express displeasure, or pretend it never happened, or let myself know, quietly, that I was displeased. But the upgraded and beautified part of me was in a state of disorder and chaos. Even though the dreamer has had no prior contact with the concept of the waking dream, the themes that have emerged from her metaphoric associations are focused and clear: She is experiencing an inner conflict that has damaged the “upgraded and beautified” part of herself. Since she’s a novice, it remains to be seen how she will react.